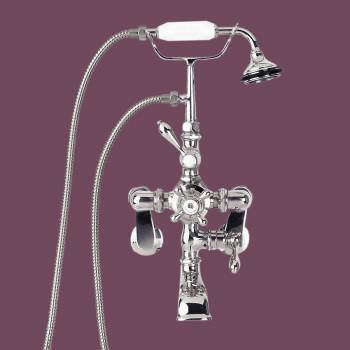 Chrome wall mount tub faucets: Tub faucet with hand held tele shower. Sophisticated anti-scald valve system Water supply connectors adjust from 2" to 12" on center. Overall height is 18". Projection is 7". Perfect forRenovator's Supply's Rolltop, Slipper, Lionfoot and Arcylic tubs. To use with Dual tub or other tubs with deckmount holes (need to order deckmount couplers.) Finished in non-tarnish Chrome.